This album was originally titled "Savage & Sensuous Bongos." Why the producers dropped the "bongos" from the title is beyond me. This album is all about the bongos. Exotica in the mold of Les Baxter and Martin Denny it aint. This is a fast paced and at times, almost all percussion album. But it came out of the era of bongos and beatnicks. One listen to this album with that in mind and you can almost see impossibly thin people in black turtleneck sweaters and beanies standing around snapping their fingers and saying "crazy man, crazy." Today, this album sounds like it could be background score for a 60's car chase scene. I'm not sure where the sensuous comes in, but it is definately savage bongos at their craziest man. The album cover was changed. 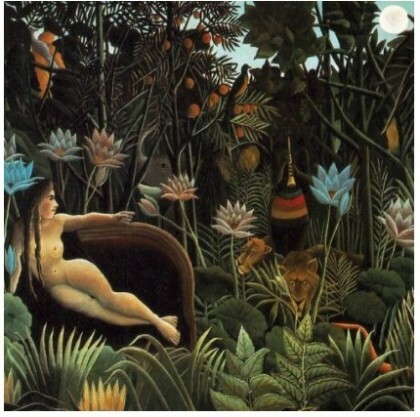 In this case they used Henri Rousseau's "The Dream" for whatever reason.